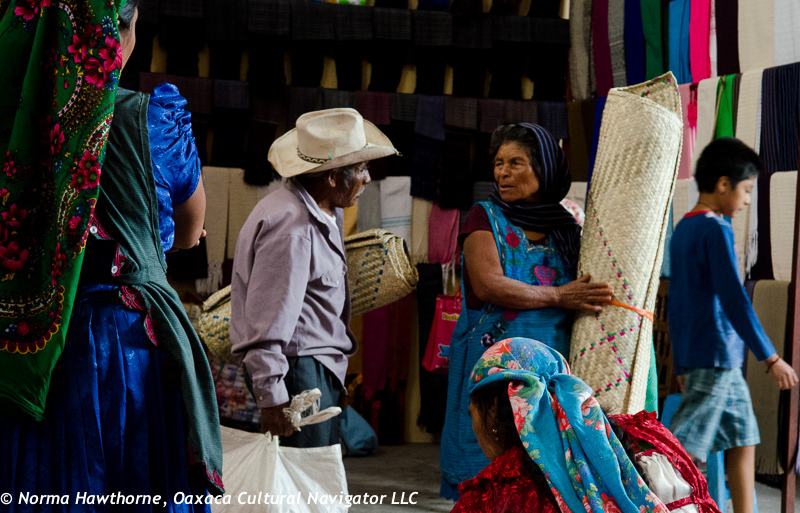 Here in the Tlacolula Valley, and most villages surrounding the city of Oaxaca, the apron is more than a utilitarian article of clothing used to protect the wearer’s garment from getting soiled. It is a statement of identity, style, and social class. 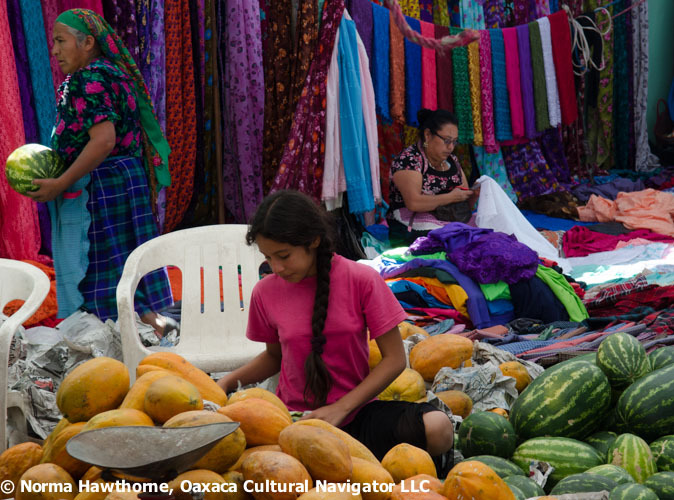 Tlacolula market scene with women’s aprons as personal and village identity. 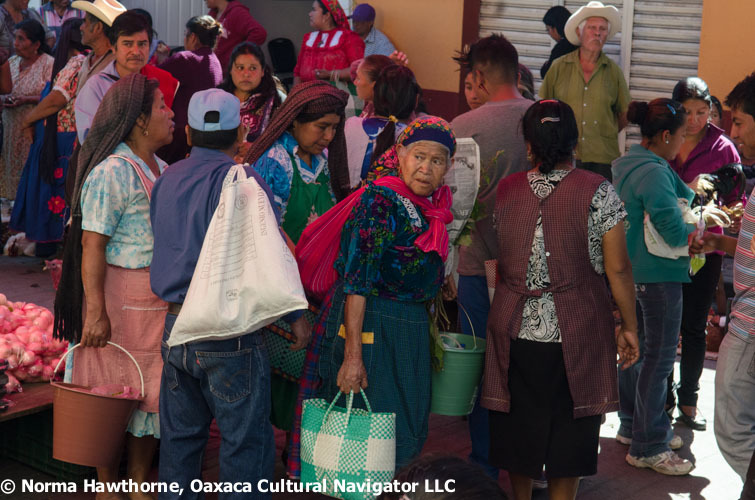 Walk around the Tlacolula Market on Sunday, or any day for that matter, and you will see women, old and young, covered in aprons. You can identify their villages by apron style. 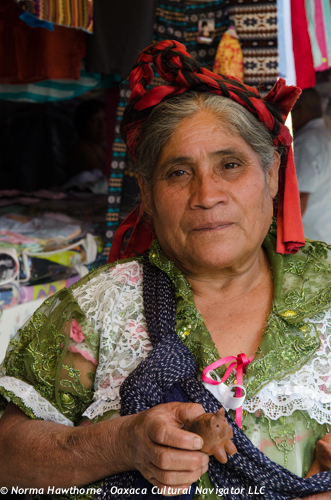 For example, women from San Miguel del Valle wear a bib apron with an attached gathered skirt that has a heavily embroidered hem. 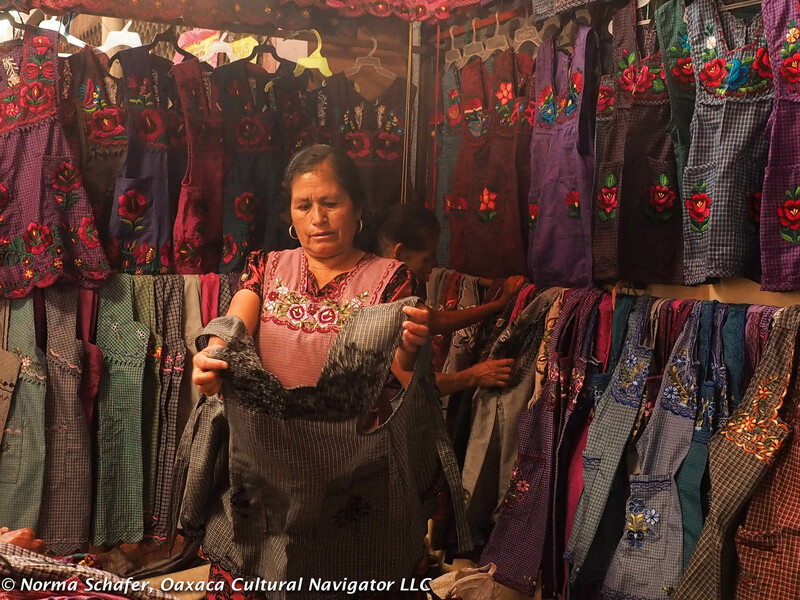 The aprons worn by women from San Marcos Tlapazola are cotton with pleated skirts often trimmed in commercial lace or bric-a-brac. 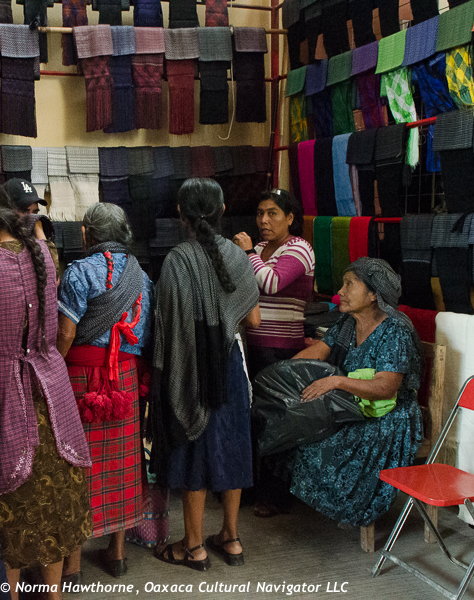 Evaluating apron style, quality and price. Do I really need a black one, too? 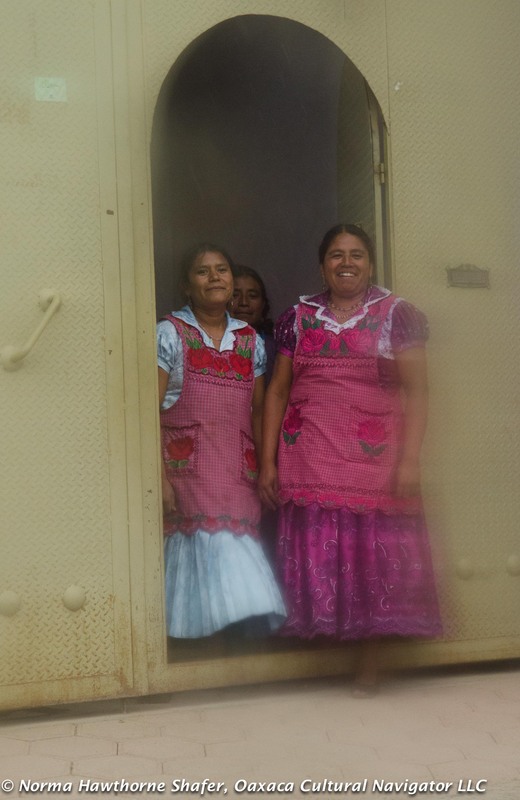 Teotitlan del Valle women prefer gingham cotton aprons with scalloped bodices and hems, trimmed in machine embroidered flowers, plants, fruits and sometimes animal figures. 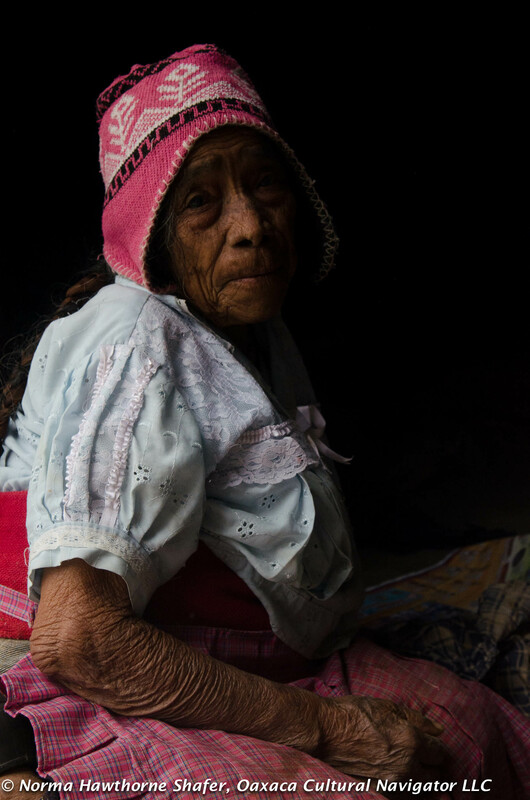 There are fancy aprons, more densely embroidered for Sunday wear and special fiestas, and simple ones for everyday to cook, wash clothing and tend to babies, grandchildren and guajolotes. He likes to cook, too. 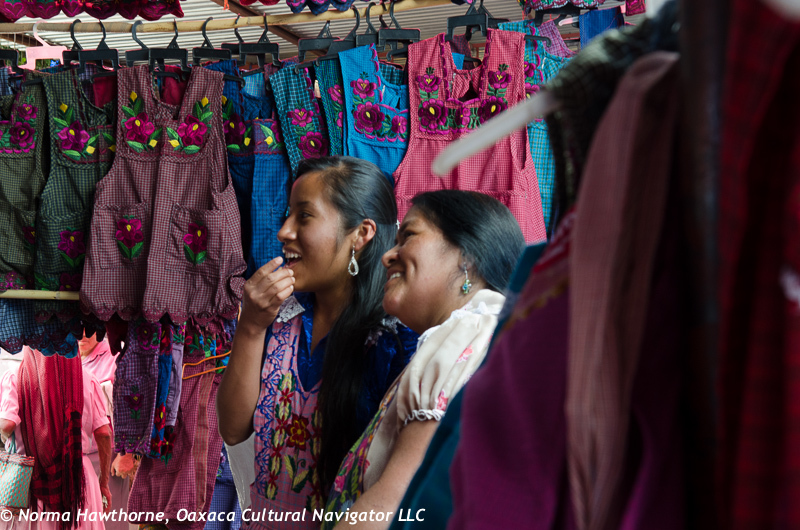 Having fun in the Tlacolula market. 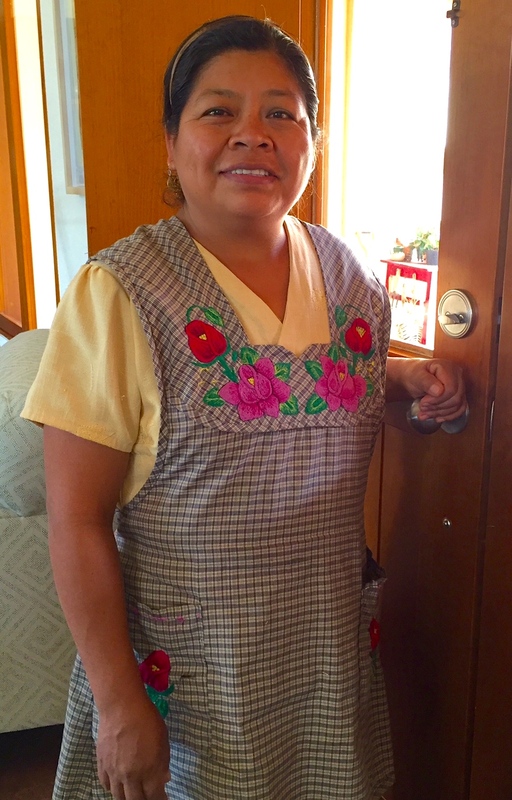 The apron is worn by grandmothers and granddaughters alike. It is a uniform that conveys personal identity, social status and wealth. 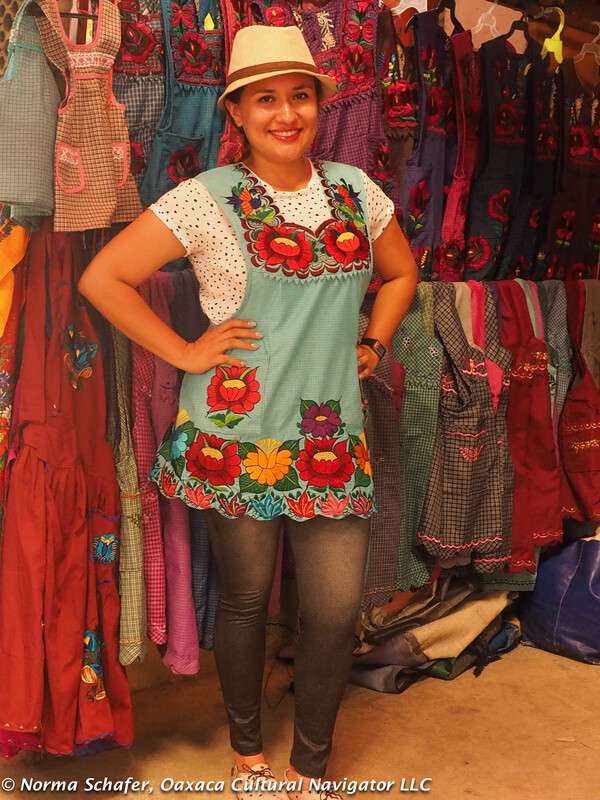 The heavily embroidered apron cost much more, as much as 350 pesos compared to the everyday 150 peso variety. You would want to wear your fanciest apron to the market to bring the oohs and aahs from contemporaries who admire your choice of color and design. 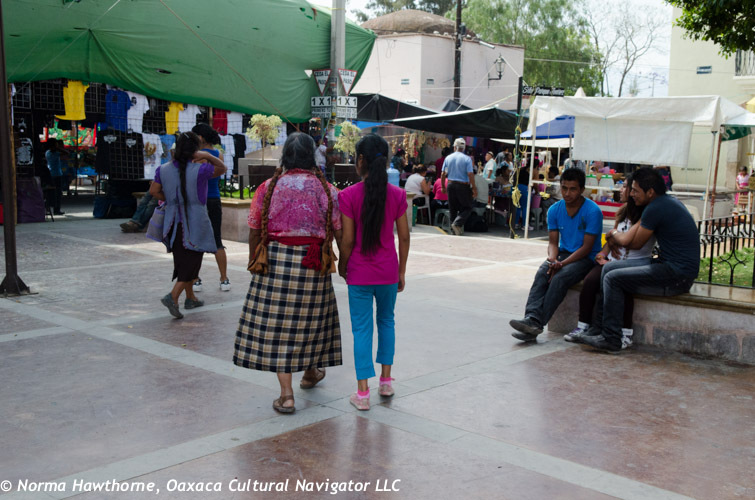 Market day, a daily occurrence in Teotitlan del Valle and a regional weekly event in Tlacolula, is the social center for towns and villages. 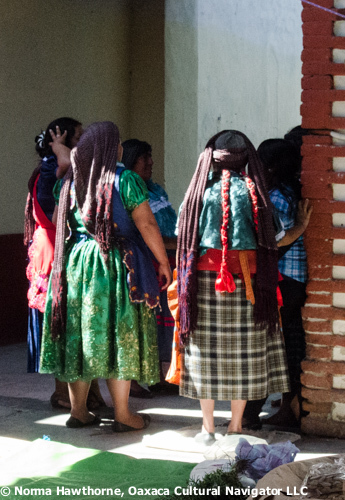 It is the time when women greet and mingle with each other, some even sneaking off together for a morning mezcal. 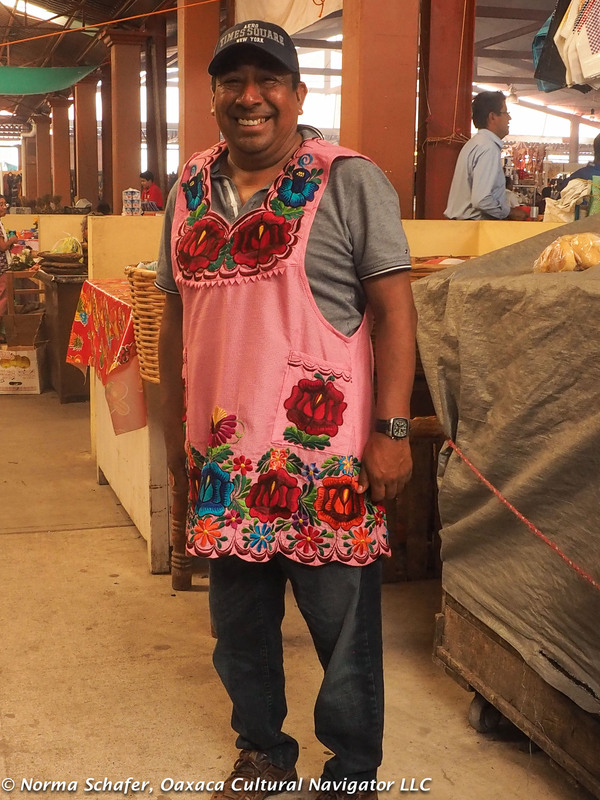 Apron as fashion statement! Who needs a fancy dress? When you get home, you change to the daily apron for working. Aprons are handy because they have deep pockets. Perfect for holding the coins of commerce. They are also convenient because you don’t have to wear a bra. 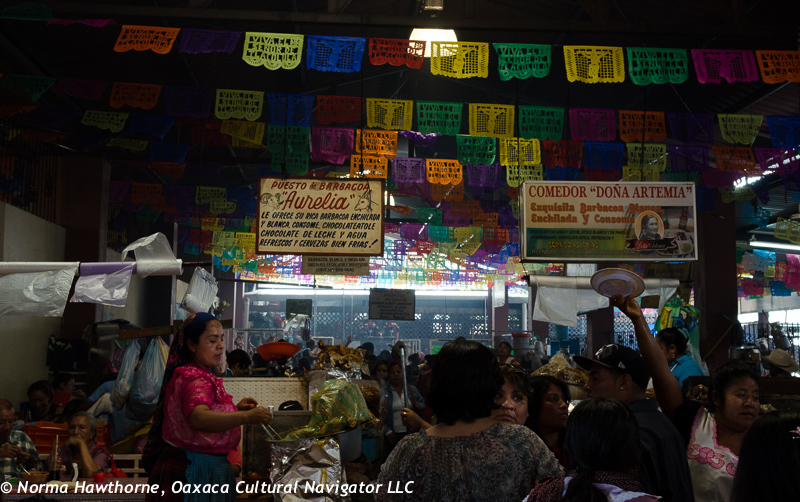 There are about eight different apron vendors in the concrete building of the permanent Tlacolula market. One of my favorites is along the exterior aisle closer to the bread section. 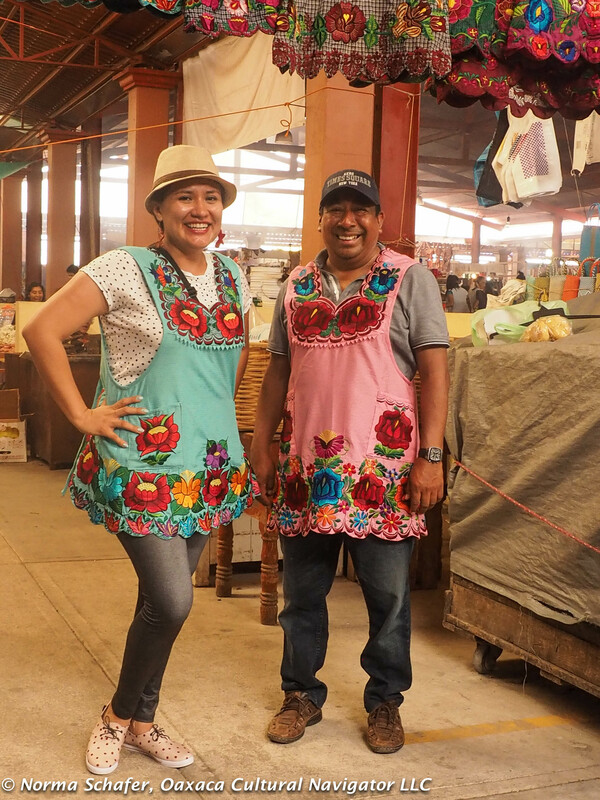 They are from San Pablo Villa de Mitla and the machine embroidered aprons are filled with fanciful images of birds, fruit and flowers. 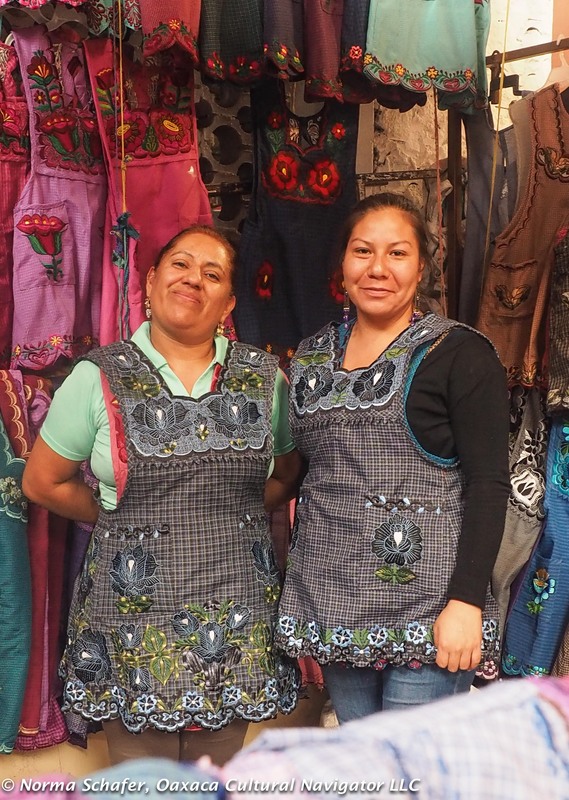 Rocio, left, demonstrates how this apron looks. She is proud of their work. Every apron is different. You need to try on at least several to compare size and quality. Make certain there are no stains and that the embroidery around the neck and the pocket placement is even. One for her, one for him! My dad was a potter and I grew up with a potter’s wheel and an electric kiln in our garage. 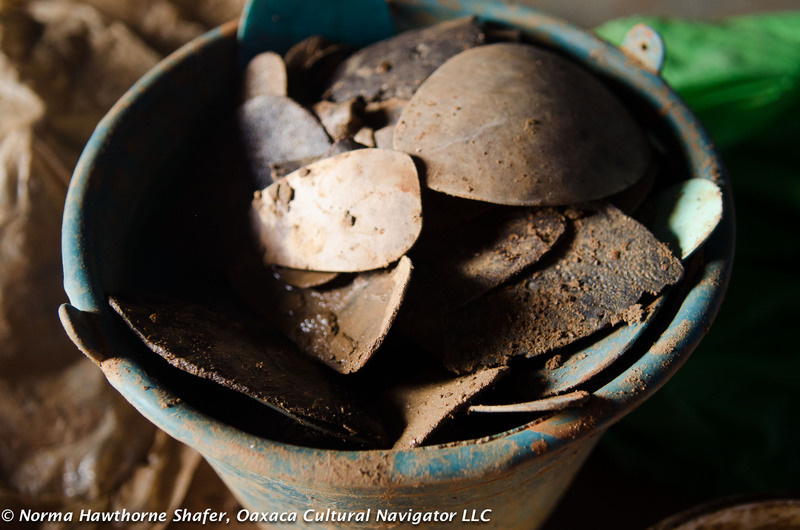 Tools were piled on the table, where also sat clay forms drying to the leather hard before he put them into the oven. This is where he would go to work when he came home from work. For him, I think, putting his hands on the clay of earth and forming it into something beautiful or whimsical or functional was his joy, more fun than work. I always have a special feeling for people who put their hands on clay. 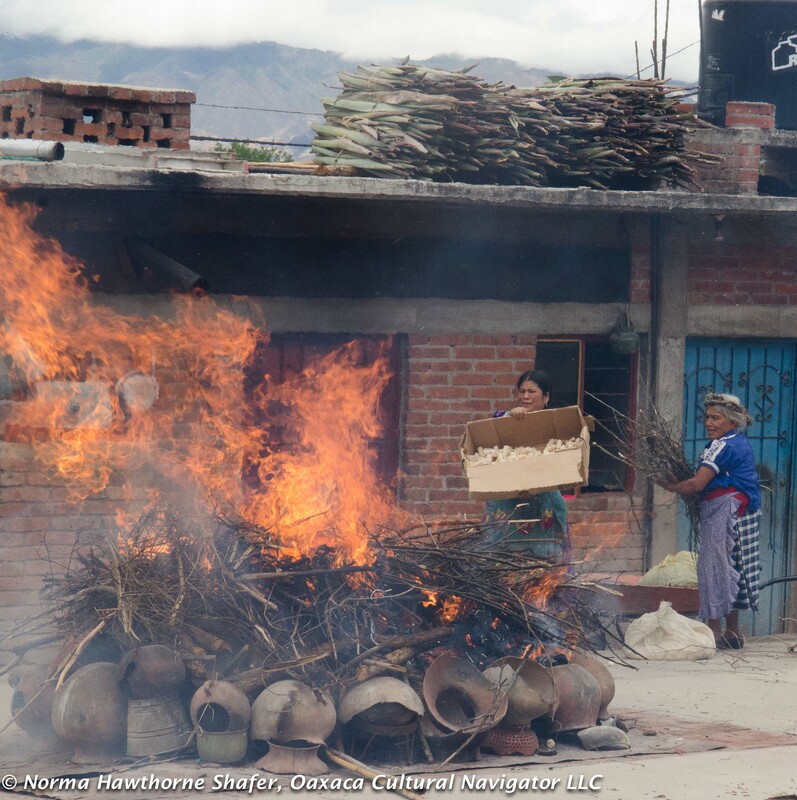 In San Marcos Tlapazola, just 8 kilometers behind Tlacolula, in the foothills, the Mateo Family women work with an organic low fire clay body that becomes unglazed, utilitarian and decorative pieces for hearth and home. It is lead-free and safe to eat from and cook with. We work with our hands. We bring the mud from our fields. It takes a week to dry it. We wet it. Stir it, strain it and mix it with sand. Finally, we let it dry under the sun to make it. We are ready to work with it. 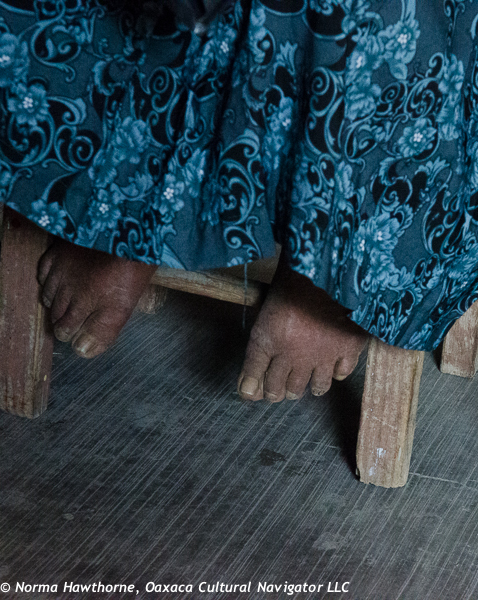 The vessels are made on a simple turning wheel as the women sit on the floor. 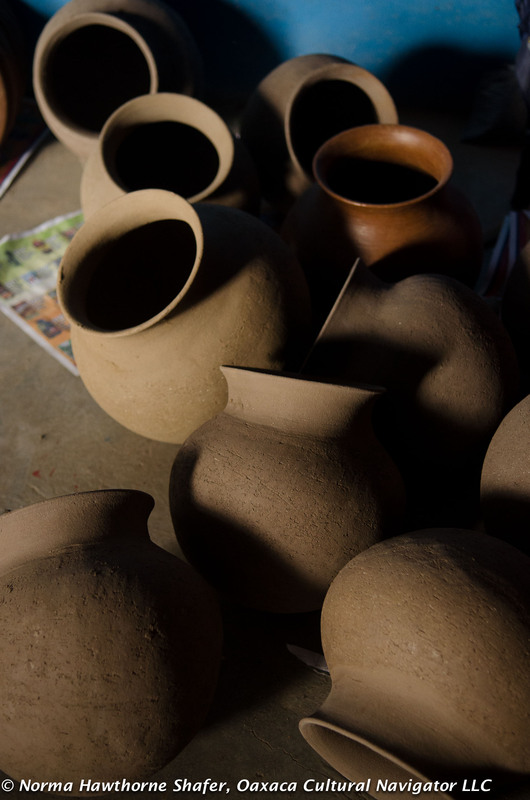 They use pieces of wood, stone, coconut shell, gourds and corn cobs to shape and polish. 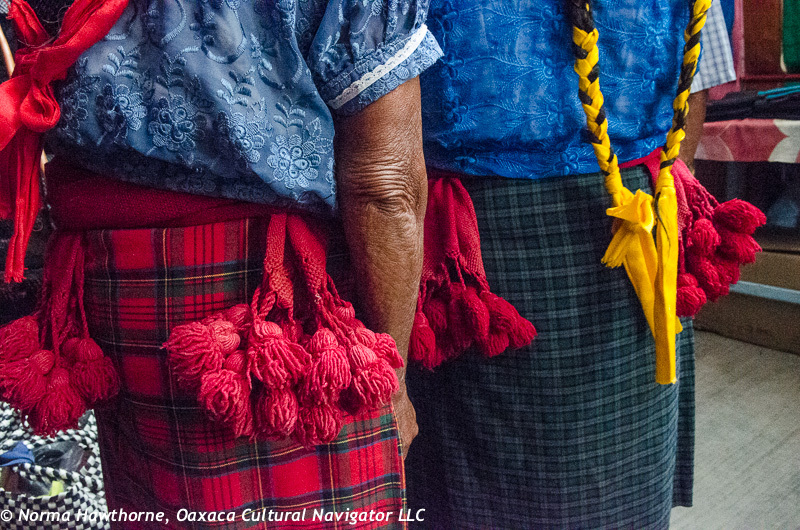 You might recognize them as they sit on their knees, on petate woven grass rugs at the Sunday Tlacolula market. 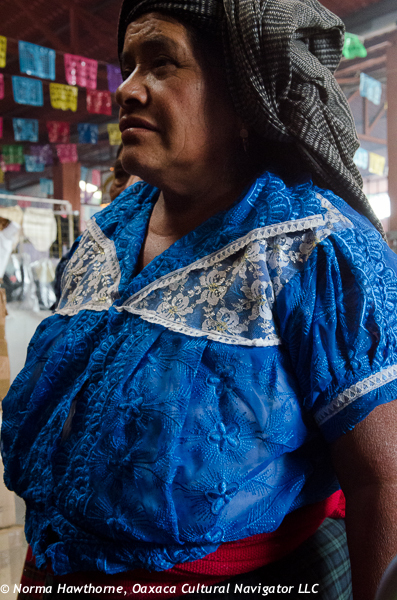 You might notice them as they pass through the restaurants and food stalls calling out their wares for sale. Their dress is distinctive and colorful. 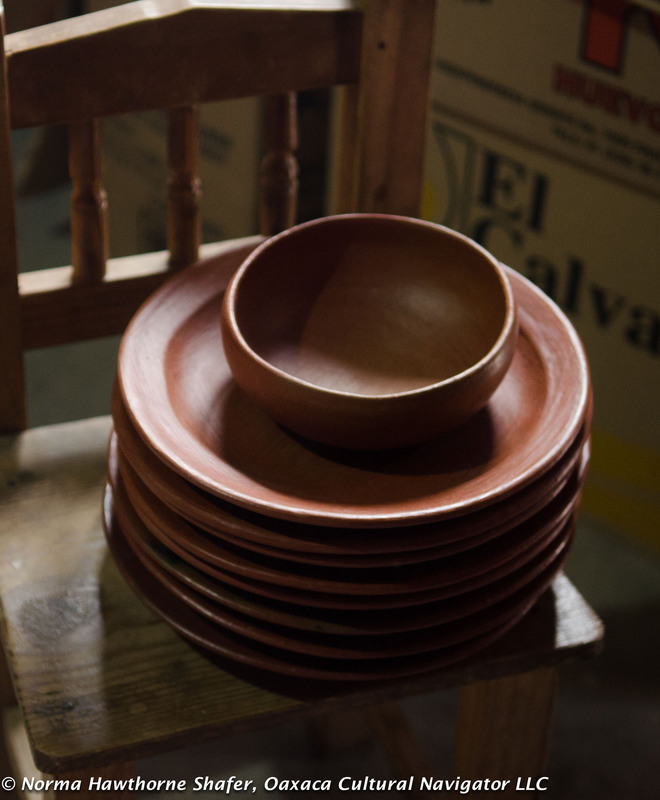 They sell comals of various sizes, bowls and plates, platters and large vessels perfect for cooking soups and stews. 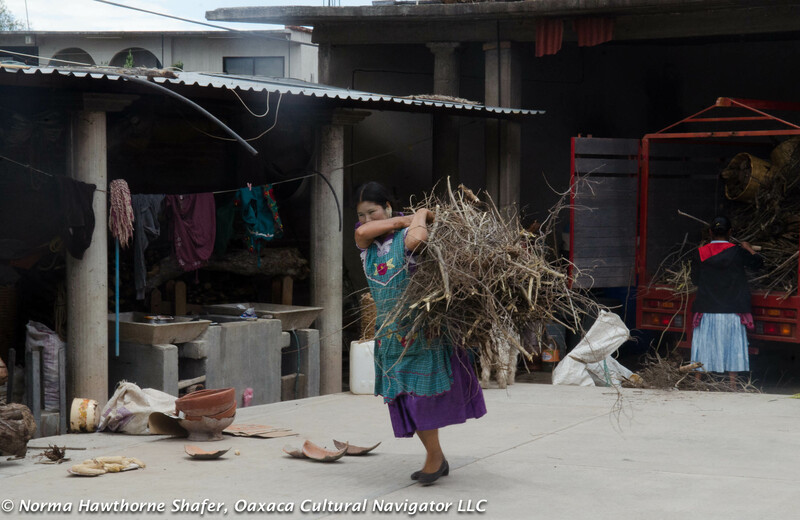 But, the best, largest and most impressive pieces are in their San Marcos Tlapazola home workshop studio. Here, tall jugs are decorated with chickens and roosters, pot lid handles might be dancing dolphins or turkey heads or pig snouts. 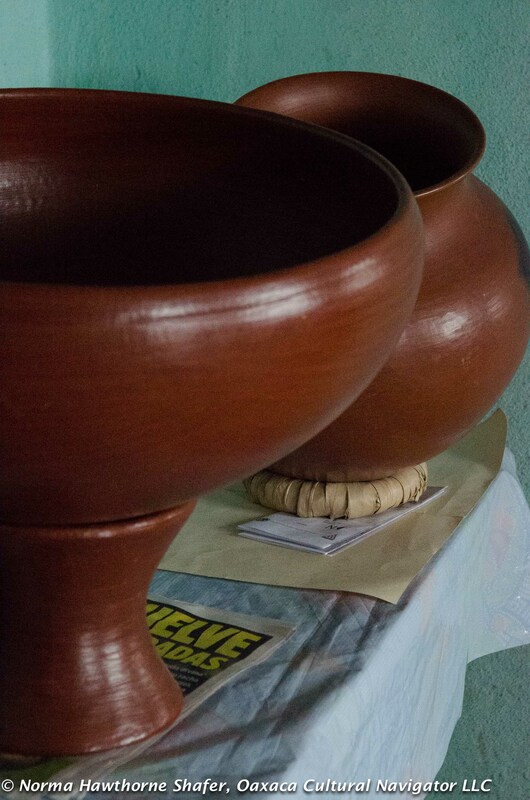 You might even come across a national award-winning bowl sitting regal on its clay pedestal throne. 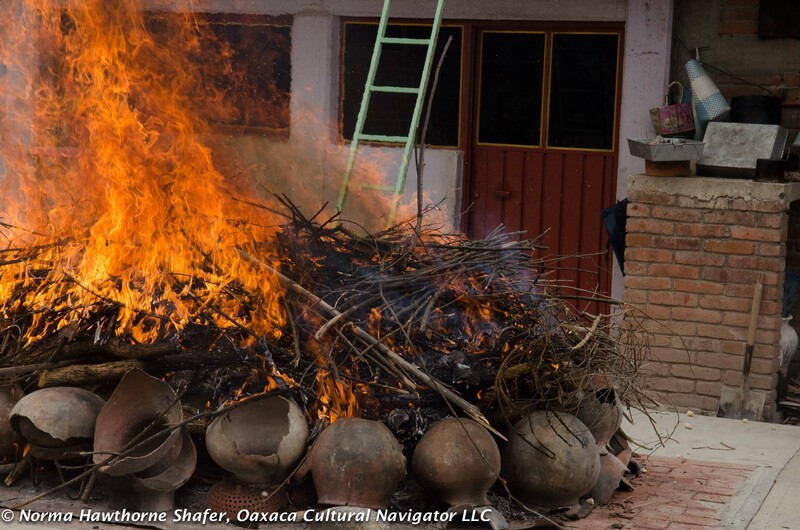 The selection is enormous and often you can see the black fire flash in the red clay form, giving it an elemental connection to the earth, wind, fire. When we got there, we came into the courtyard filled with smoke. It was firing day. 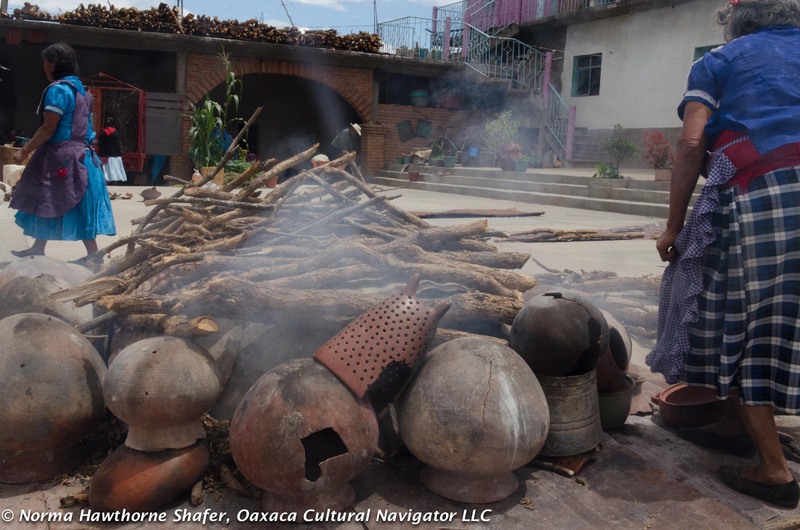 The pots were hidden under corrugated metal sheeting, piled with tree branches, dried corn husks, discarded bamboo sticks, twigs, brush, and protected by a ring of broken pots to keep the heat in at ground level. 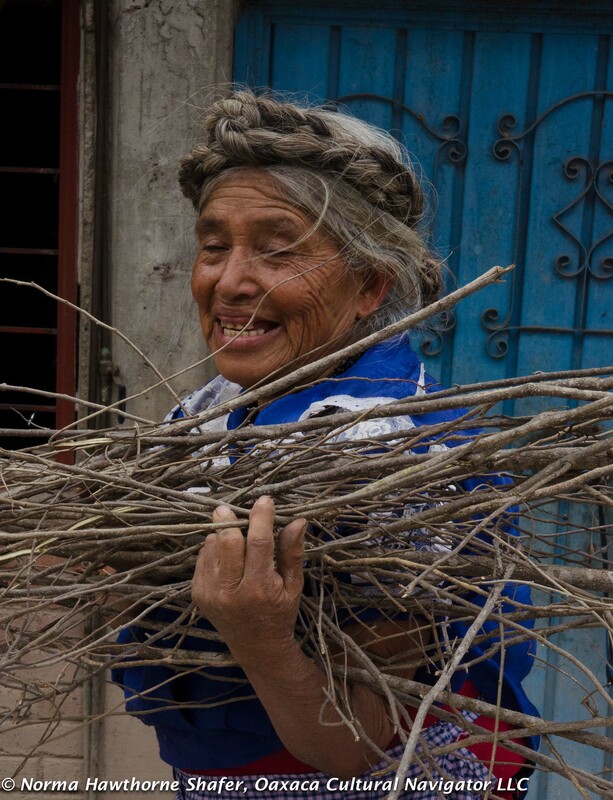 We arrived just in time to add our bundle of brush and branches to the fire. Here at Matamoros No. 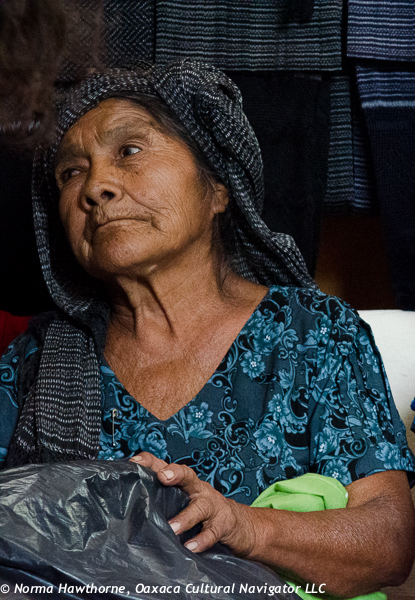 18, in San Marcos Tlapazola, live the parents, sisters, cousins and nieces of the extended family of Alberta Mateo Sanchez and Macrina Mateo Martinez. The home phone number is 951-574-4201. The Cel is 951-245-8207. 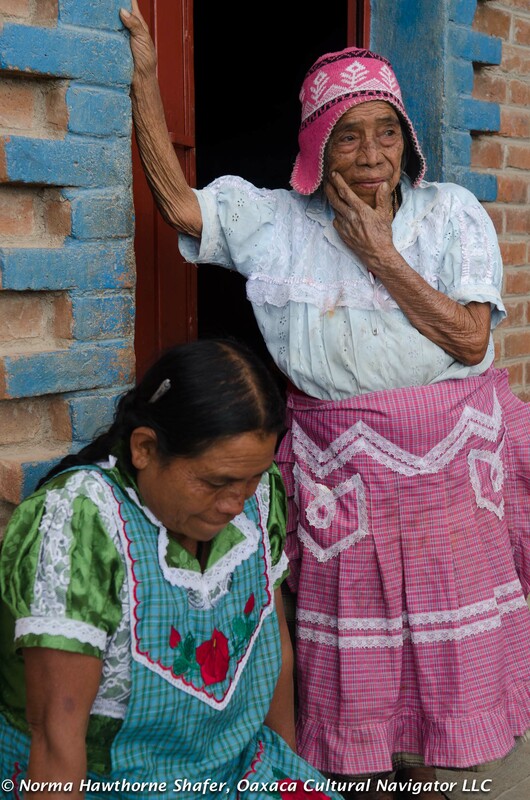 Their mother Ascencion is ninety years old. Almost as old as my own mother who just turned ninety-nine. Call to make an appointment to be sure they will be home. Maybe you will be lucky enough to come during a firing, as we did. As we shopped, the rains came and the wind whipped. It wasn’t a heavy downpour but a light Lady Rain drizzle that causes the smoke to curl through the courtyard and burn our eyes. As we left, the rains made a mist and droplets coated the car window through which I took these ethereal photos below. 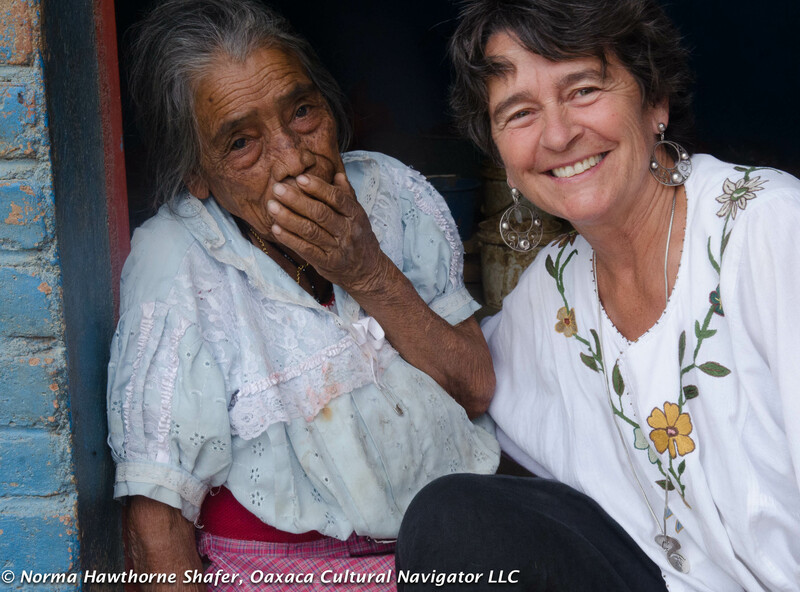 Thanks to Merry Foss, Oaxaca folk art collector and dealer, and Sara Garmon of Sweet Birds Mexican Folk Art, Santa Fe, NM, and Christopher Hodge for taking me on this adventure. How to get there? 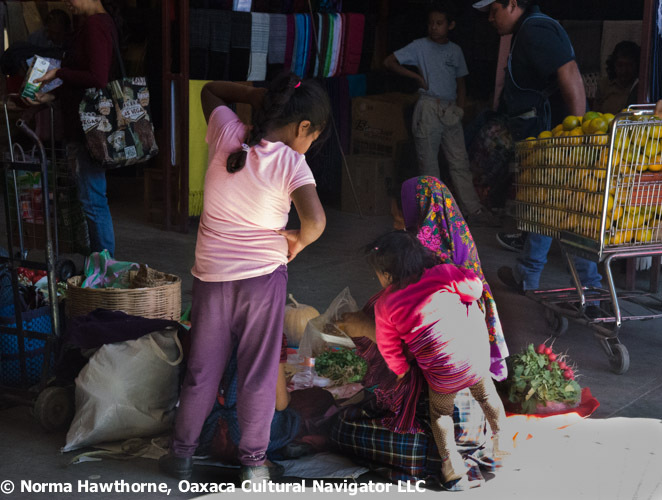 Go toward the hills behind Tlacolula, following the road that goes through the center of town. There will be a crossroads at 4km. Turn right and continue another 4 km until you get to the village. You will see the traditional church in the distance as you wind to the right through high desert. 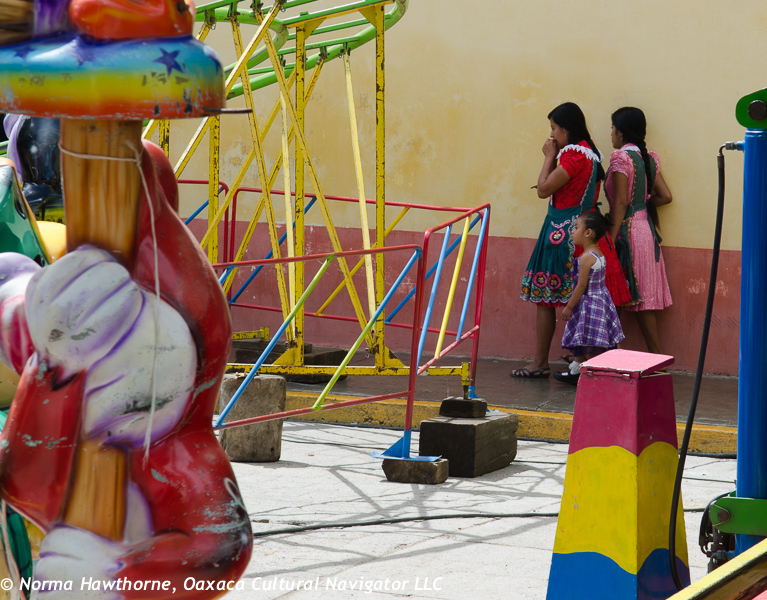 The main street is Matamoros and the sisters’ house is on the left past a couple of blocks past the church. 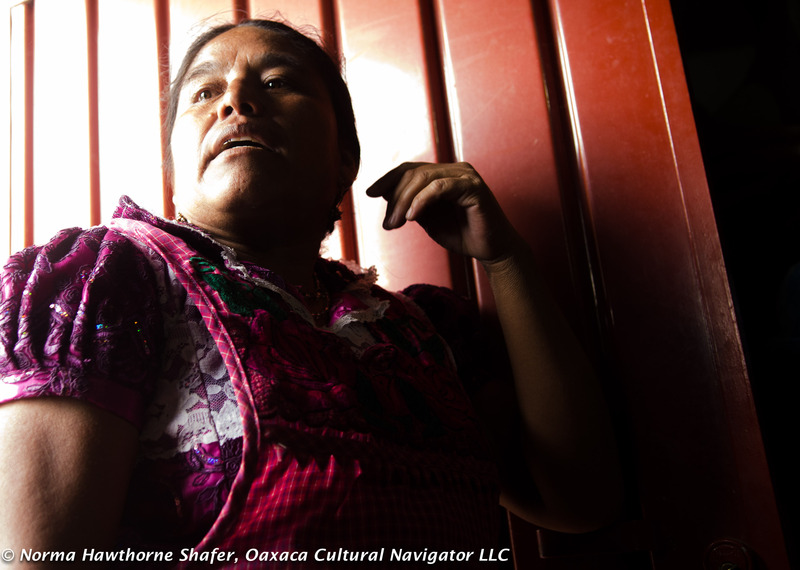 Look for the sign: Mujeres del Barro Roja. We didn’t set out to buy two cute, baby guajolotes. It just happened. An impulse purchase, you might say. My impulses tend to center around clothes, jewelry, or maybe a larger than necessary size ice cream cone. 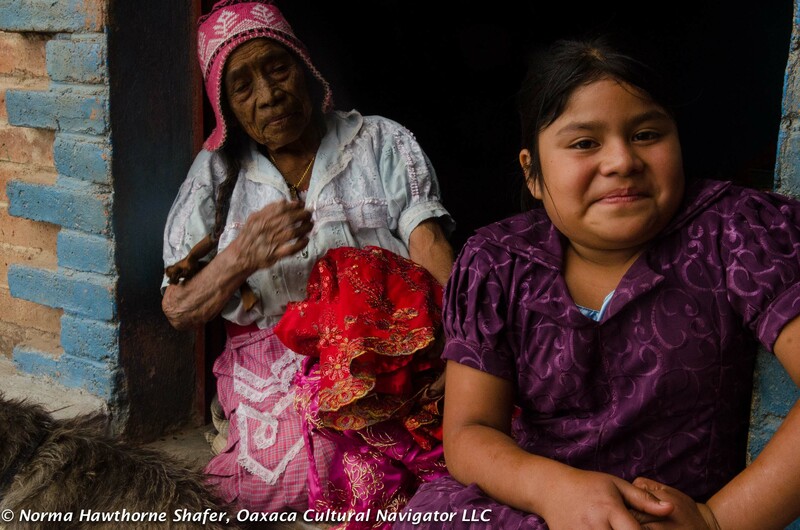 My Zapotec neighbors, on the other hand, covet what they can add to their barnyard. 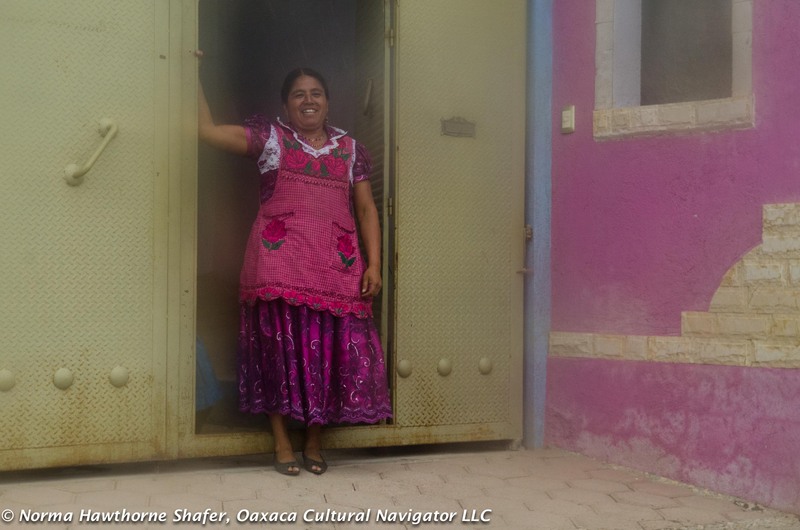 Where I live in Oaxaca, one sign of a woman’s wealth and independence is how many pigs, goats, guajolotes, or chickens she owns. 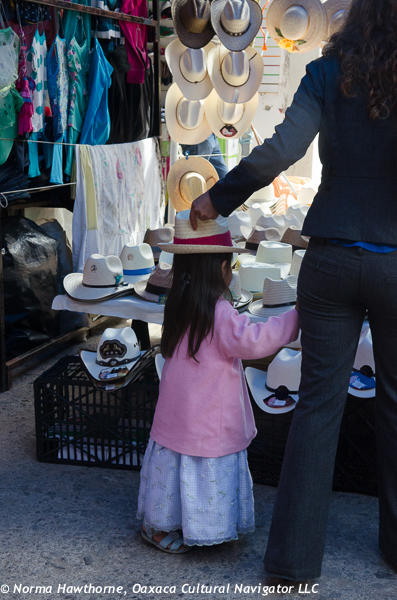 Raise them to plump and they convert to pesos in a year or so. Pocket money she can do with as she pleases. 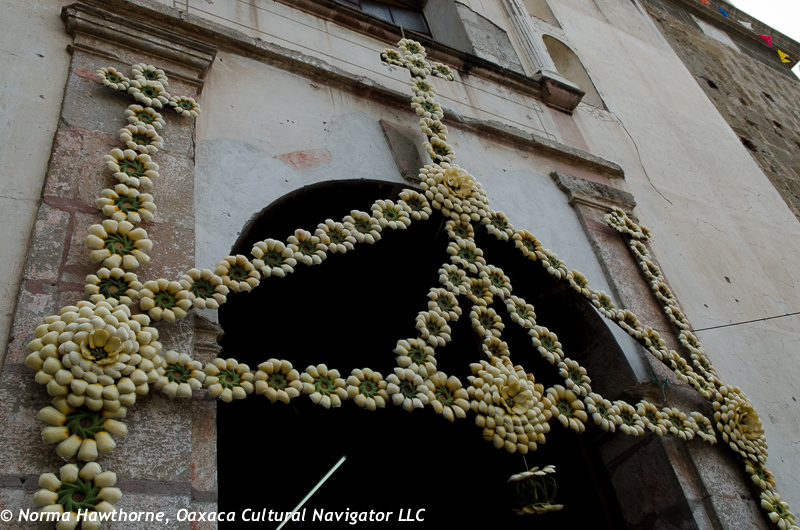 What is a guajolote, you may ask? 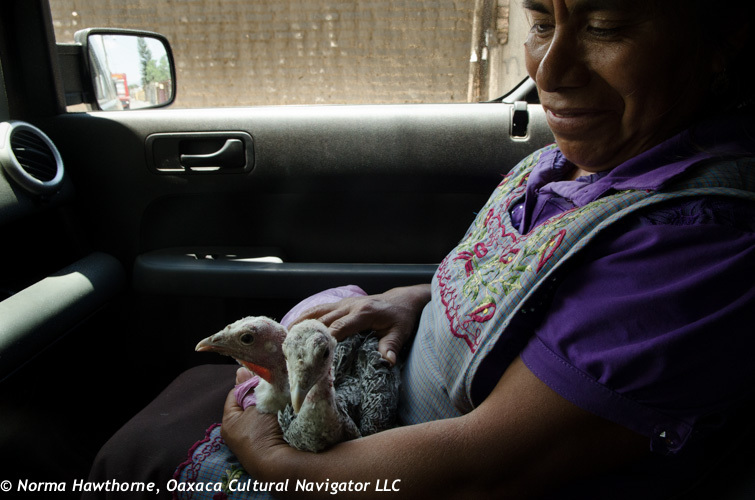 This is a pre-Hispanic wild turkey indigenous to Mexico, named by the Aztecs, and preferred to domesticated turkey by locals in the know! 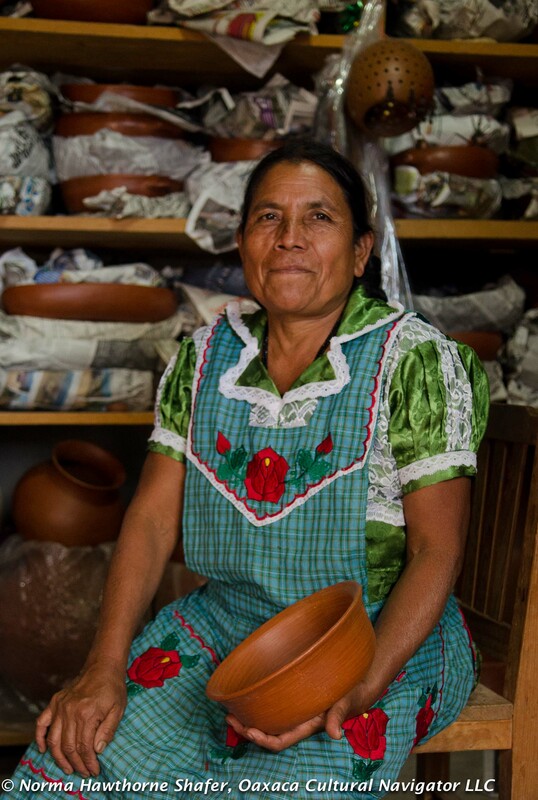 I had no particular goal in mind on Sunday, my last day in Oaxaca until June, but to pick up some little clay dishes made in San Marcos Tlapazola for my sister. She uses them as handy soap dishes. 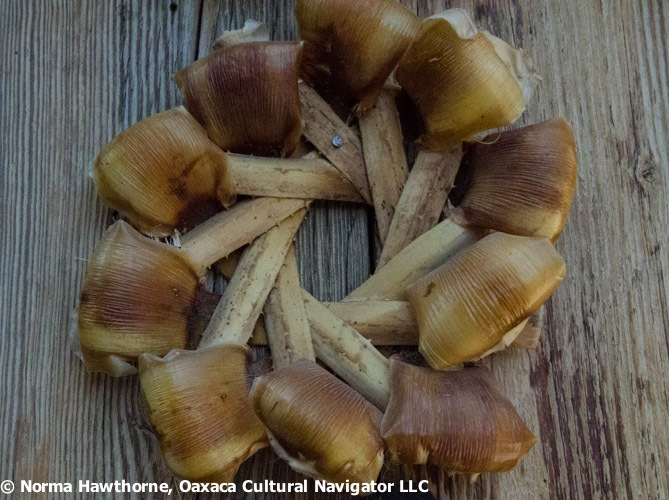 Some people use them for salsa. 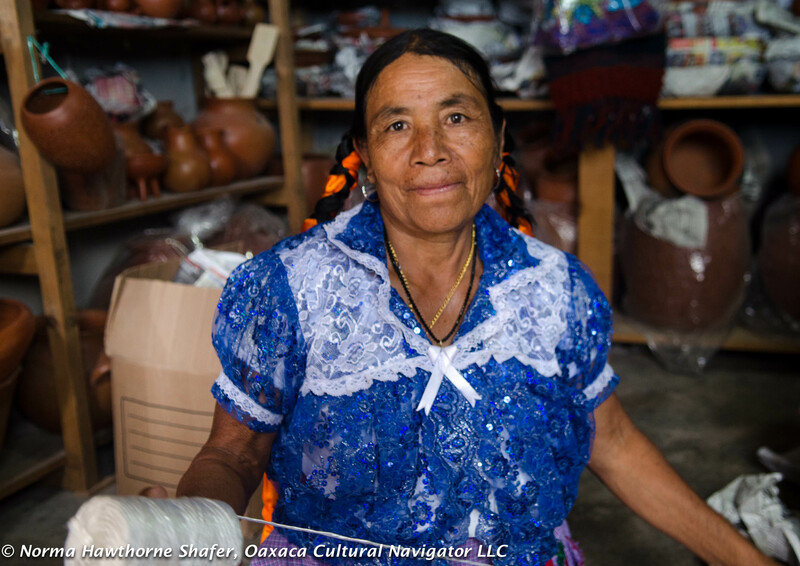 The ladies of San Marcos ply the market with bundles of little clay vessels and figures wrapped in their rebozos held close to their bosoms. 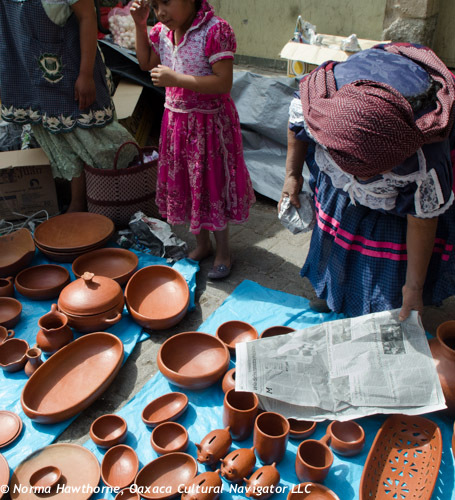 They also set up shop on the street, displaying platters, clay pitchers, tortilla griddles, and other kitchen essentials. I’m especially fond of their primitive figures. My neighbors had no particular goal in mind either. We wandered for a while. Then, they went shoe shopping. 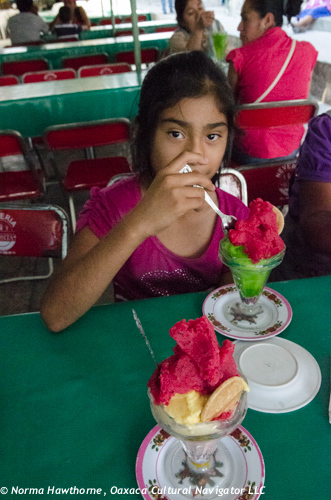 We stopped for nieves at my favorite Tlacolula purveyor Nieves Rosarita, one of the many stalls that line the street near the Banamex bank ATM. 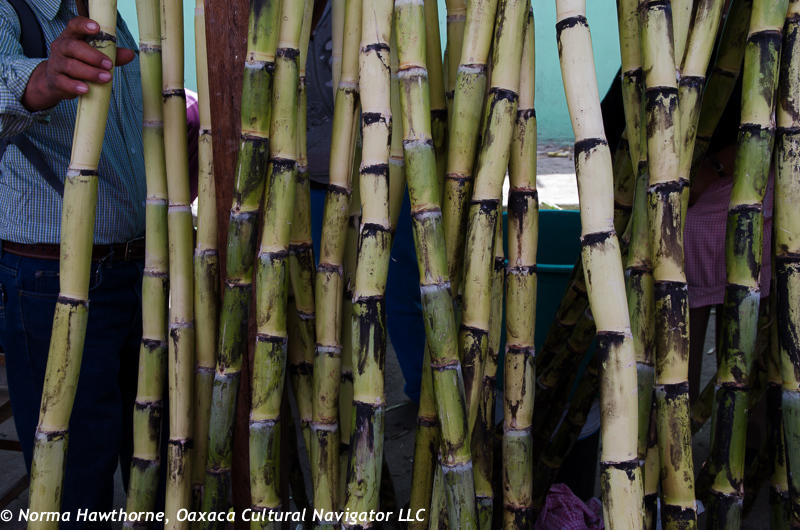 Nieves means snow in Spanish, is like ice cream but with less cream and more intense flavor. 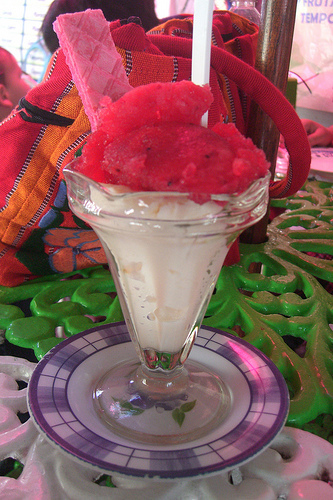 My favorite is Besos de Angel with cherries, nuts, and fresh grated carrots. Truly yummy. 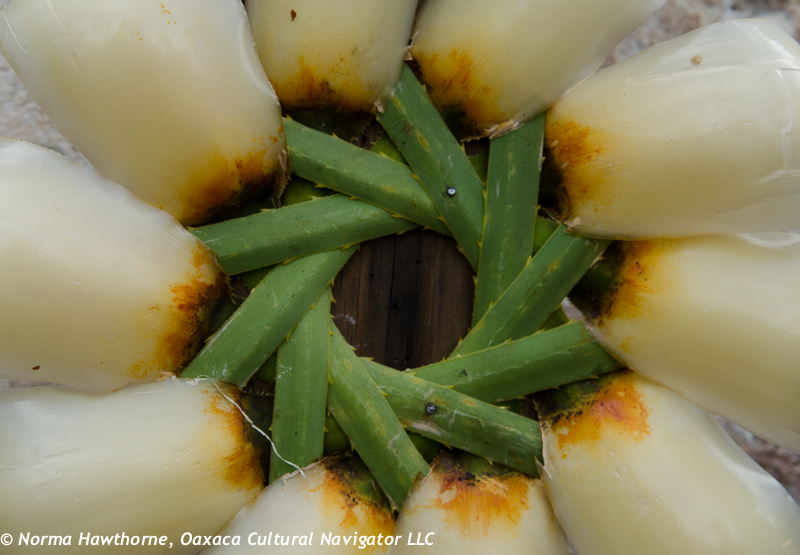 Especially when topped with tuna aka the fruit of the nopal cactus, not the fish. 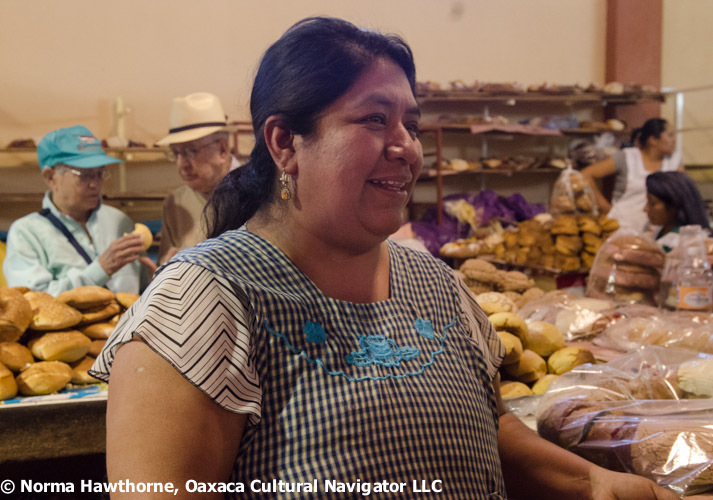 Next, we followed the abuela through the labyrinth to find the seller of Atzompa green pottery, and finally began to make our way out of the market back to the car. Then, there they were. Love at first sight. None of us could walk away, though I must confess we tried. I even reached out to touch their silky smooth feathers. 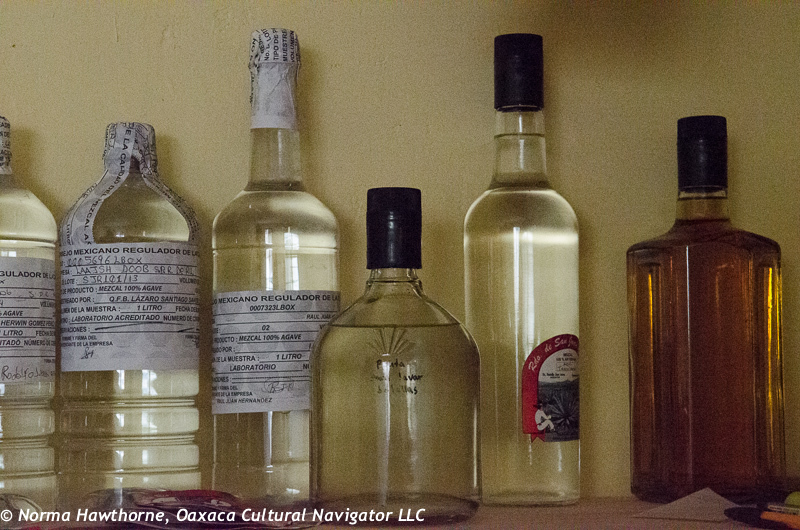 After a heavy bargaining session, not one, but two guajolotes had a new home. We could tell by their chortles and cries that they needed to be together and this was, in part, a guilt purchase, too. On the way to the car, many people stopped us along the way in envy. Envy is when another admires something you have and then asks, how much did it cost. The humble reply is to always understate the value. This is not a boastful culture. As they settled comfortably on the lap of their new owner in the front seat of my car, I reached out to stroke their long skinny necks. Their eyes closed and they fell asleep on the ride home. Definitely a first for La Tuga and me! 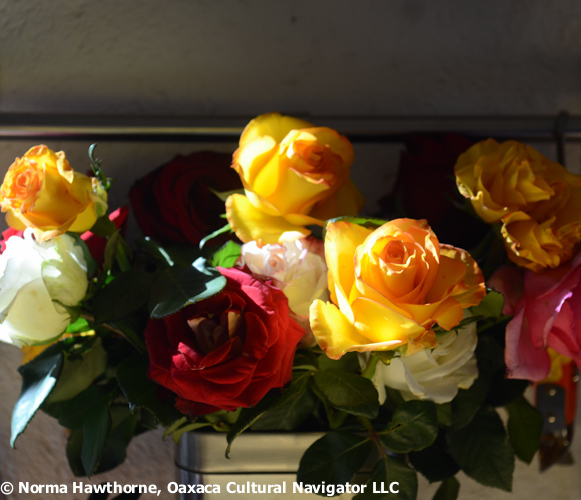 It feels like springtime here in Oaxaca, although we are still celebrating Christmas. Yesterday was downright warm, with temperatures rising to the low 80’s, though nights can be a chilly 45 or 50 degrees. 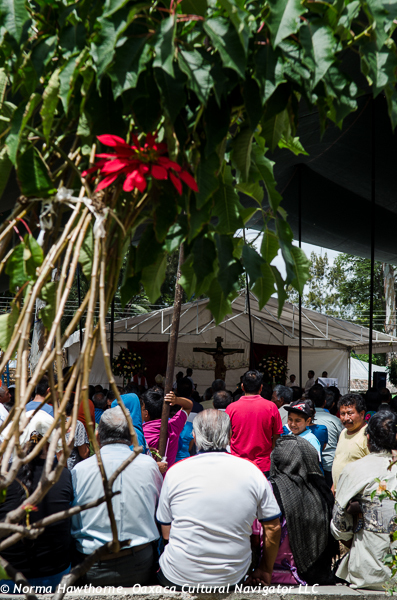 Christmas here is an elaborate and lengthy celebration, starting on December 12 to celebrate the Virgin of Guadalupe and officially ending with Dia de la Candelaria on February 2. 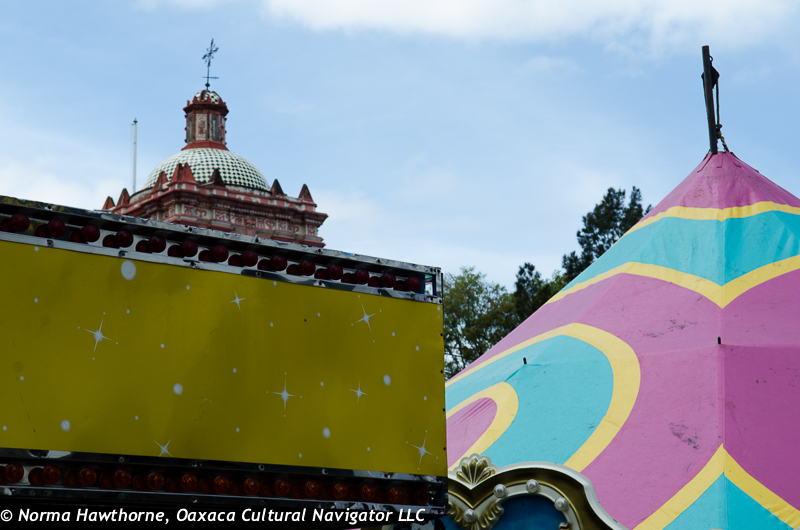 The Three Magi, or Wise Men, arrive on January 6, for Day of the Three Kings or Dia de los Tres Reyes. 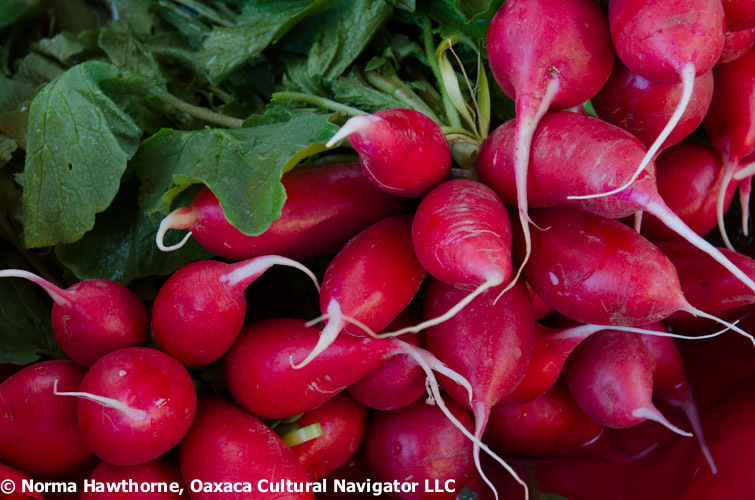 You have probably figured out that food motivates me almost as much as textiles. 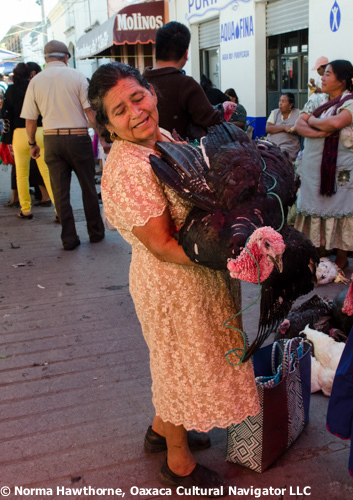 So, this morning I was off again to the wondrous, expansive Sunday tianguis — portable street market — in Tlacolula de Matamoros, ten minutes from where I live. I wanted to see what was in store for food preparations. 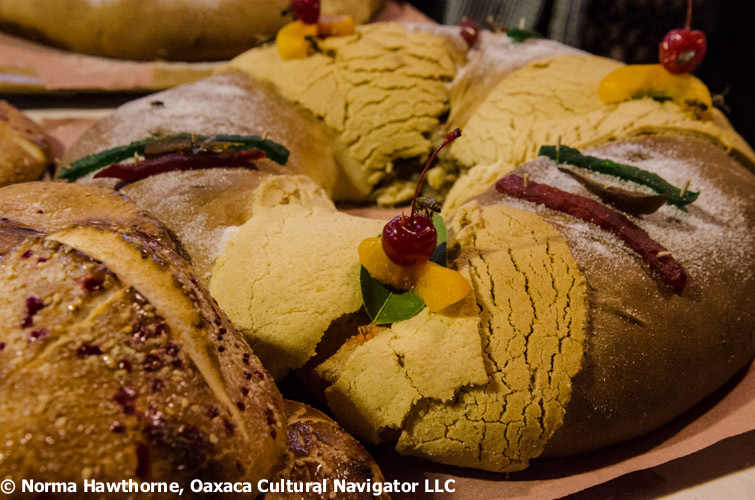 Front and center is Rosca de Reyes, a round or oval fruit-studded sweet bread, a traditional delight. 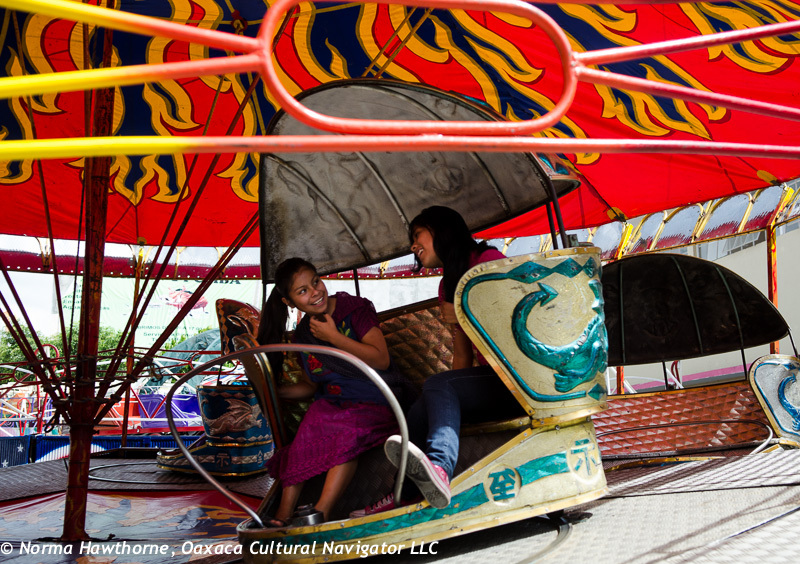 Most Oaxaca celebrations are home and family centric, with a children’s gift exchange and a spin the top gambling game with whole nuts. When you go visiting, it is customary to bring a small gift for children and one of these bread loaves. Tucked inside the loaves are one or several little plastic dolls that symbolize the baby Jesus. 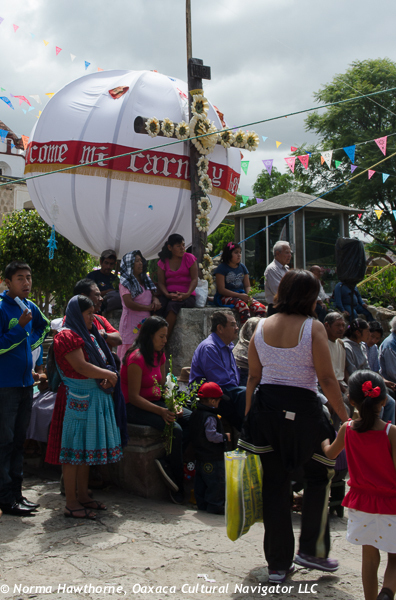 Whomever gets one of these dolls embedded in their slice of Rosca is obliged to host a tamale party on Candlemas. 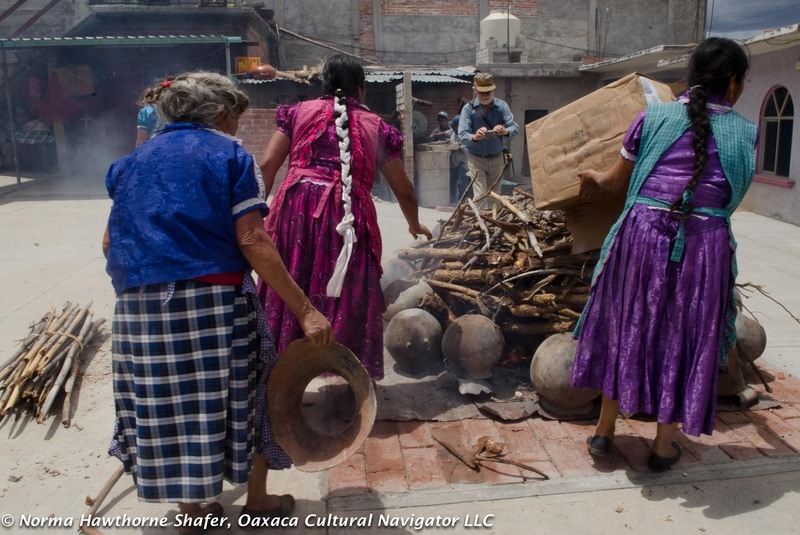 Corn and tamales, symbols of sustenance, are interwoven into this and other Mexican celebrations. 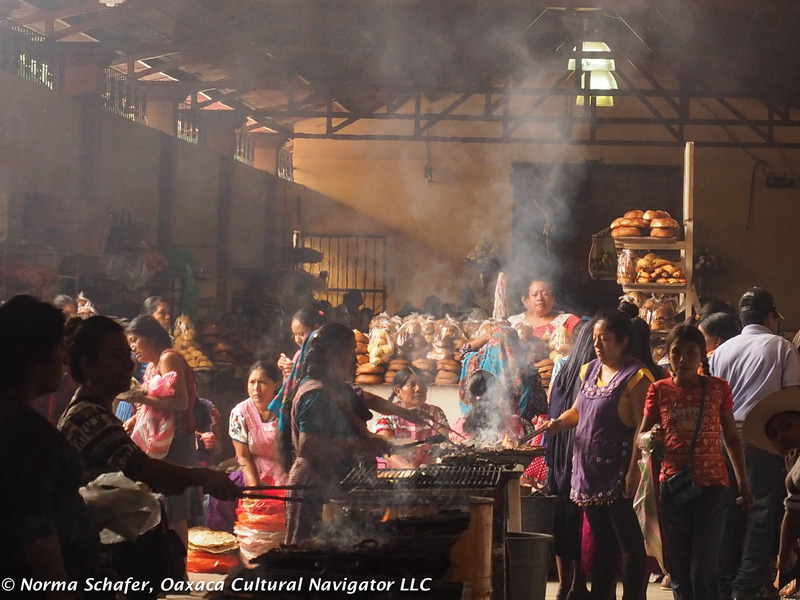 Today in the Tlacolula market the bread section was piled high with pan de yema, a sweet egg bread, shaped in the round. The vendors were doing a brisk business. This year, bakers added decoration of sliced, canned peaches to accompany the candied dates, prunes, pineapple bits and cherries. 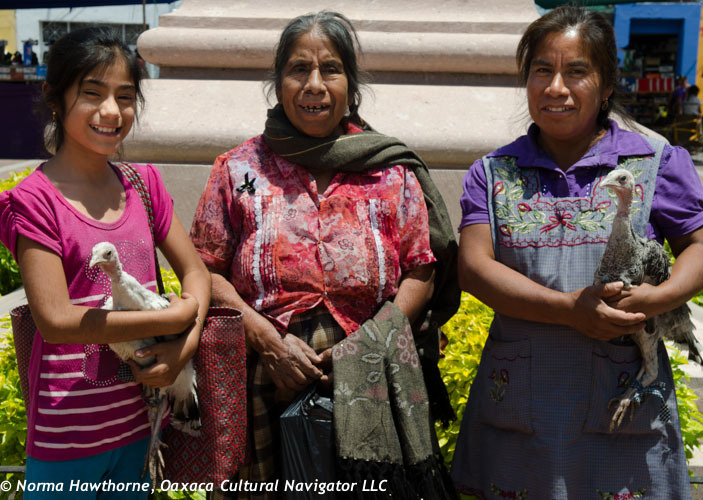 Live poultry, like guajolotes and chickens, are a big item, too. 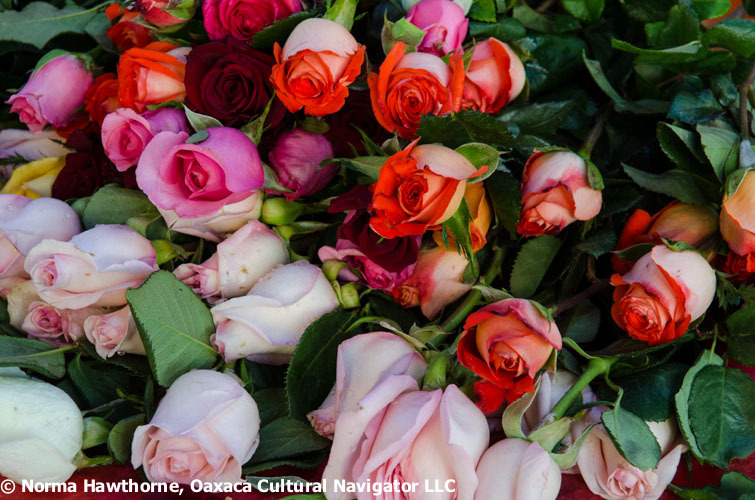 Add to that roses ($1 USD a dozen), huge papaya (10 cents each), mangoes, melon, strawberries, watermelon, avocado (5 cents each USD), and any number of types of other fresh fruits and vegetables at everyday bargain prices. For those who forget to bring their shopping baskets or buy more than they planned, there are specialty vendors who sell these, too. 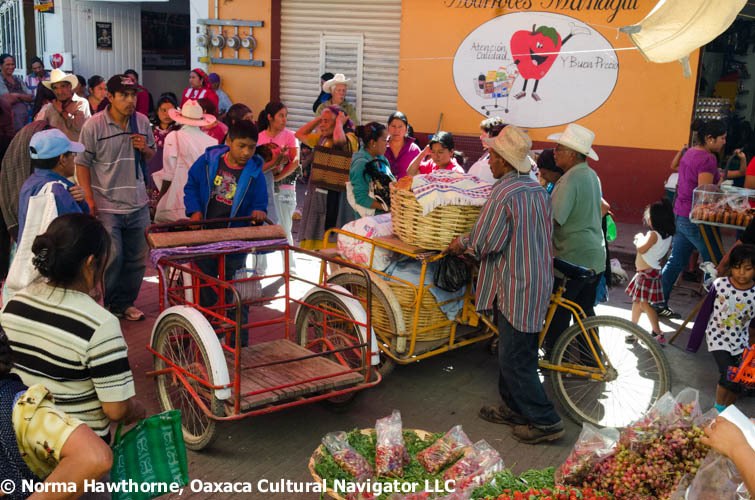 I like to arrive at the market by 10 a.m. to take a leisurely stroll through the streets. Before noon, there are not a lot of people and there is no line at the bank ATM located on church side street. Later, it’s packed and it’s like bumper cars with people. Lunch is a special treat at Comedor Mary, located on the opposite side of the church on the street that borders the permanent market. 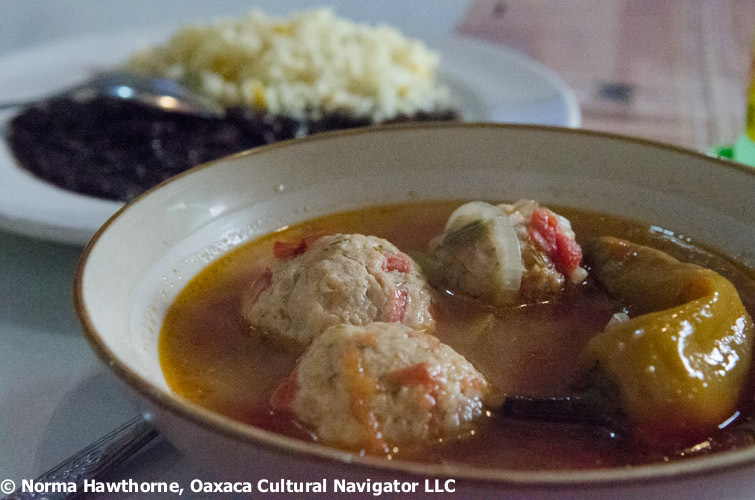 Today’s special was albondigas con pollo — a picante broth with fresh ground and spiced chicken meatballs. Amazingly delicious. 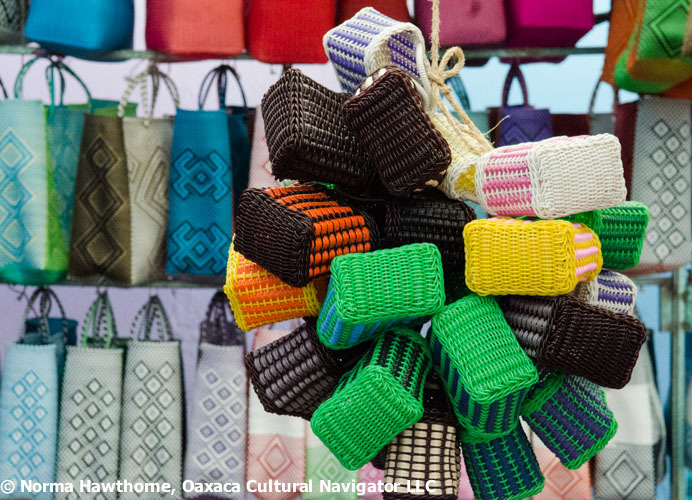 This is the season to come to Oaxaca and stay a while. It is a feast for all your senses. And it is senseless to stay wrapped up in frigid northern weather if you don’t have to! Feliz Año Nuevo.